My House Republican colleagues and I are focusing on good jobs and careers for all Pennsylvanians, working to improve our workforce development and career and technical education opportunities, and advancing policies to help transition people from minimum wage jobs to family-sustaining careers. As part of the latest bipartisan CTE legislative package, my bill to establish the Career and Technical Education Partnership Tax Credit Program was approved by the House Education Committee and now goes to the full House for consideration. House Bill 522 would allow direct investment from businesses that contribute to career and technical partnership organizations. Business contributions could be used to provide career and technical education scholarships, or to purchase industry-standard equipment. This program would be unique yet modeled after successful elements of the Educational Improvement Tax Credit Program. Other parts of the package include bills that would boost awareness of workforce needs and increase the flexibility for secondary CTE programs. Bills would also create a comprehensive online CTE resource center and coordinate state-level career exploration and workforce development opportunities. This week, the House Health Committee heard testimony about difficulty in attracting doctors and other health care employees to Pennsylvanians. 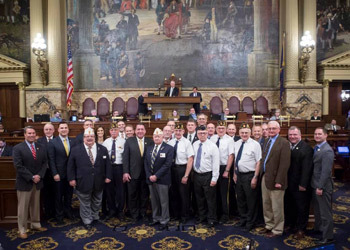 This week at the state Capitol in Harrisburg, I helped to commemorate the 100th Anniversary of the American Legion. The American Legion has been a staunch advocate for veterans and their families since 1919. It was founded on the four pillars of care for veterans, a strong national defense, Americanism, and children and youth. Today, the American Legion has more than 2 million members and more than 13,000 posts worldwide. I am thankful for the American Legion and everything it is doing to protect the interest of our military personnel on whom we rely to protect us. 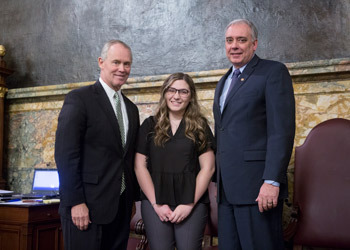 Ava Connell, a senior at Tri-Valley High School, joined me in Harrisburg on Wednesday. During her time at the Capitol, Ava was able to get a close look at state government in action from the floor of the House, and to attend multiple meetings with me. Ava is an exceptional young woman and student. I wish her all the best in her future endeavors! Pictured with us is Speaker of the House Mike Turzai (R-Allegheny). To provide more time to recover stolen property, the House approved legislation that would allow for greater tracking by law enforcement of stolen jewelry and other items containing precious metals, as well as fight the opioid epidemic as the sales often fund the purchase of illegal drugs. House Bill 350 would require dealers in precious metals to maintain the purchased items for 10 business days, as well as a photocopy of the seller’s proof of identity. The bill would also require dealers to maintain a copy of their annual license application at each place of business for inspection by the public. House Bill 350 now advances to the Senate for consideration. The House unanimously approved legislation which would improve public safety by strengthening penalties for operating a motorcycle without the proper endorsement or license. House Bill 384 would increase the fine for driving a vehicle without the proper endorsement for that type of vehicle to $200 plus fees and surcharges, making it equal to driving without an operator’s license. 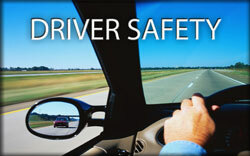 In Pennsylvania, the fine for driving without a license is $200 plus fees and surcharges. Meanwhile, the standard fine for operation of a vehicle without the proper endorsement is only $25 plus fees and surcharges. With the thaw out of spring comes the growth of potholes on Pennsylvania’s roads. Extreme fluctuations in temperatures, coupled with an active snow season, can contribute to more potholes on our roads. To help combat potholes and prevent them from becoming a danger to vehicles and drivers on the road, you can report potholes to PennDOT. You can report potholes by calling 1-800-FIX-ROAD or by clicking here to file a report online. During last year’s cleanup, 108,638 volunteers collected more than 7.7 million pounds of litter from Pennsylvania’s roads, trails and shorelines. Approximately 5,300 events were held, with every county participating.